I was a well known Mathematician and a scientist. I felt to do something different, and studied spiritualism. As I was good in Mathematical probability, I put the first Decision Theory for what to do if God exists or not. It was named Pascal Wager. I recommended in believing in God is better than not believing in God. 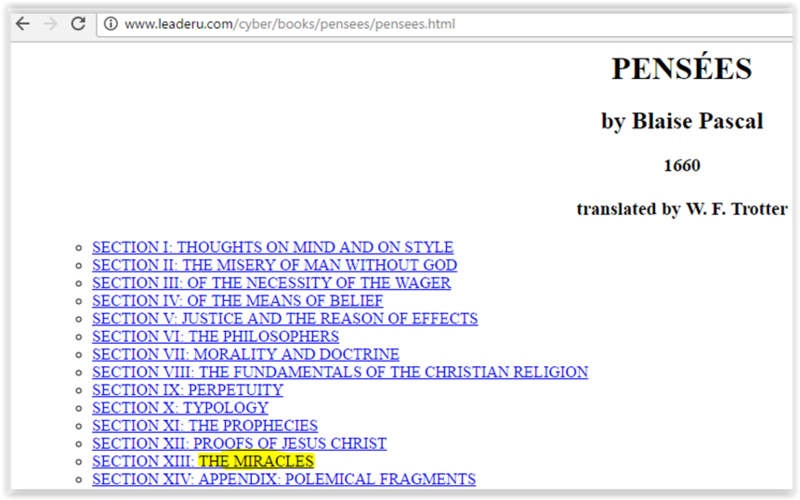 My book ‘Pensees’ means Thoughts has mentioned about Pascal Wager. I intentionally kept last chapter – “The Miracles” in this book. merci-thanx for this post dedicated to a world’s genius… I’m proud and honored to live in his homeland! 🙂 my very best and cheers! Yes, I appreciate you belonging to same land of Pascal. I need a favour from you. Can you share this post on 19th June on your social networking sites. It Pascal’s Birthday. Ms Pascal has been a bit of an obsession from my early teenage years. His insight and ability to pull from the air the perfect words amazes me. A true genius so far ahead of his peers! A discussion with Ms Pascal is a dream I would savor! love it love it love it. don’t believe+don’t exist = nothing; don’t believe+do exist = everything, your life required of thee. This is very thought provoking and spurred up a great conversation for my husband and me! Thanks for sharing this perspective. Thanks for visiting Turquoise Compass today. I appreciate your visit. Have an amazingly turquoise day! Hope to see you again. Good to hear it and hope it will be of help you. All the best. I really like this idea of writing! Just saw your CV and glad to know that you are an IT professional. I have also got a background in IT. Further I love blogging and like the idea that you are an “Innovator”. I liked so much to hear it in first person, as if he was speaking to us! 🙂 May God have never abandoned him. Hello Lily, Good to read your comments. I tried writing in first person but had some thought on how others will react – but with your comments I am satisfied. 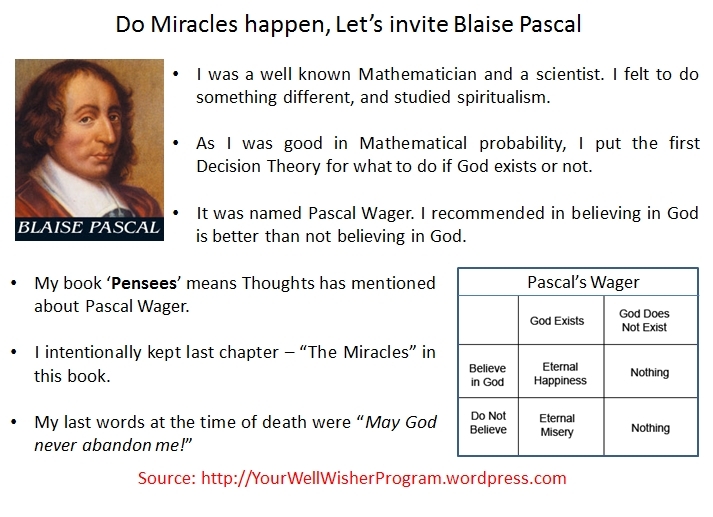 I first learned of the Pascal Wager while in Graduate School and it has been helpful when talking to others in terms of spirituality. Love your blog! Happy New Year! thanks will check yours too, will be good if you can check volunteer page and see how you may be of help. Hey! Thanks for the like on “It’s good to talk”. Where have you been????!!!!! So good to see you here on my blog again – thank you! merci-thanx for this post dedicated to a world’s genius. Truly love this post. thanks for your words – it brings lot of encouragement. Awesome website you have here but I was curious if you knew of any community forums that cover the same topics talked about here? thanks indeed for your comments – it really helps.. Yes! Finally something about sweet james bergener. thanks indeed James… your words count more for me. thanks and good to read and cheers..
thanks for such nice words.. it took me years to make it this writing.. Thanks for another informative blog. Where else could I am getting that kind of info written in such a perfect method?